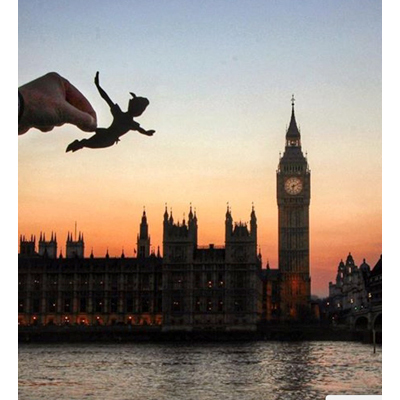 Rich McCor is a British photographer who is putting a new twist on famous monuments around the world. He has a day job working in a creative agency, but in his free time he travels and takes photos, adds cutouts and posts them to Instagram. He is known on Instagram as Paperboyo. Specifically, his craft is paper cutout photography. He began taking these photographs in his hometown of London, where he imposed a series of detailed and delicate paper cutouts to some of London’s most iconic landmarks. 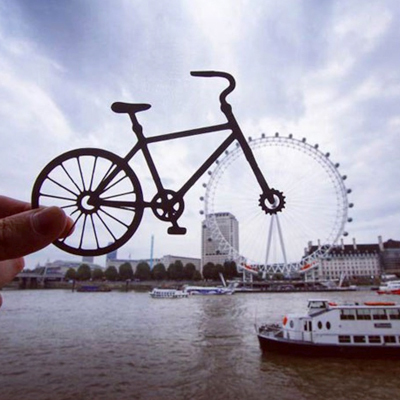 He has turned the London Eye into a bicycle and Big Ben into both a wristwatch and a destination for Peter Pan. 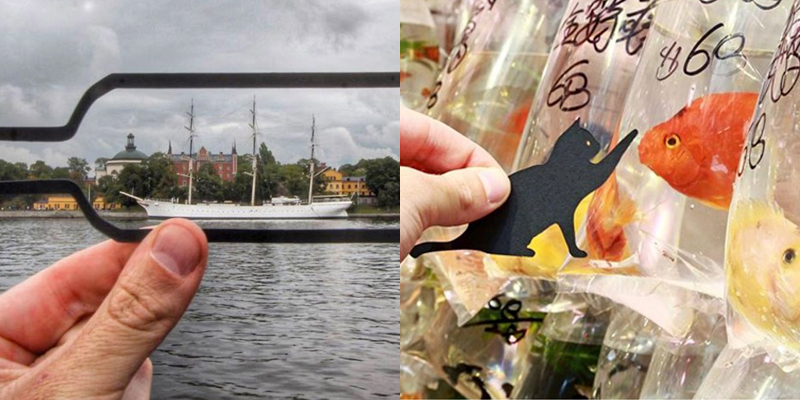 His cutout additions were posted to Instagram where they immediately attracted attention. He quickly had over 100,000 followers. 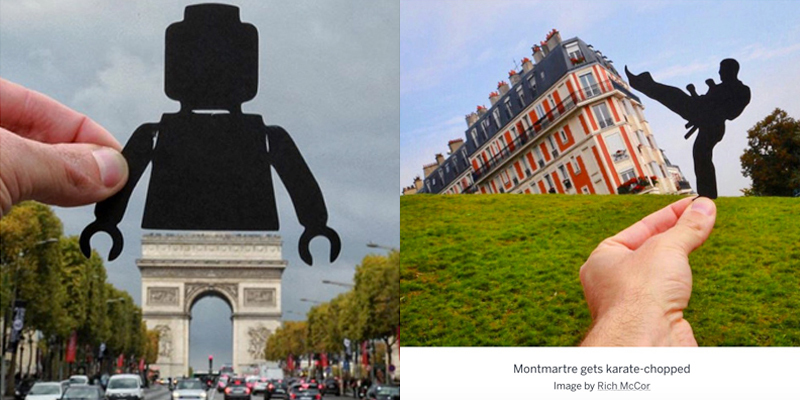 His cutouts transform iconic landmarks across Europe into fun, whimsical and amusing vignettes, and for him were fun and a personal hobby. He was noticed by a crowd-sourced website called Great Little Place London. They commissioned him to take 10 cutout photos that offered a different way to look at London and its famous landmarks. It has been a quick trip to fame ever since. Lonely Planet, the travel guide group, found him on Instagram and contacted him. They asked him to create photographs for them, and sent him to Stockholm, Amsterdam, Copenhagen and Paris. Since then he’s been to Hong Kong, and has been hired to promote the new DisneyLifeUK app by traveling around the U.K. adding Disney characters to his photos. I love his big fingers holding the paper cutout in every photograph. It makes the photo so…arts and crafty. His fingers look fine so far, but he can’t ever bite his nails or his new career will be over.